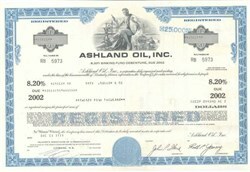 Beautifully engraved certificate from the Ashland Oil Incorporated issued in 1977. 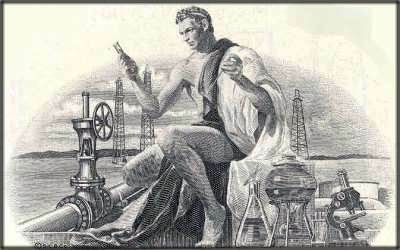 This historic document was printed by the Security-Columbian Banknote Company and has an ornate border around it with a vignette of an allegorical man testing oil in an oil field. This item has the printed signatures of the Company’s President and Secretary and is over 24 years old. Ashland (NYSE:ASH) has approximately 25,000 employees working to bring superior product and service solutions to industries and consumers around the world. With annual sales and operating revenues of more than $6 billion, we are market leaders in highway construction, chemical and thermoplastic distribution, specialty chemicals, motor oil and car-care products. We also have an equity interest in petroleum refining and marketing. A Fortune 250 company based in Covington, Ky., they have sales in more than 140 countries. We've come a long way since we started in 1924 as a regional petroleum refiner. In 1998 Marathon Oil Company (USX-Marathon Group) and Ashland Inc. merged their refining, marketing, and transportation systems to form Marathon Ashland Petroleum LLC (MAP), a competitive new company with its roots in the early years of the oil industry. For more than 100 years, Marathon Oil Company has been among the country's most successful energy companies. Company operations include major production, exploration, and power generation projects throughout the world. These upstream operations ranked fourth in operating income per barrel among the U. S.'s 17 largest energy firms in 1996 ­ and they continue to fuel remakable corporate performance. Formerly active in all aspects of the energy industry, Ashland Inc. has an exciting new focus, with a wide range of products and services. This diversity consists of the following family of companies: Ashland Chemical division, which distributes chemicals and plastics; the Valvoline division, which markets motor oil and car care products; and APAC group of construction companies; and an ownership interest in Arch Coal.